AC Milan looked like being on the verge of returning back into the top three only a few weeks ago. However, the team has suffered a huge dip in form since the winter break. Milan have not managed to win in the last five games – a run that includes four consecutive defeats. Pressure on manager Vincenzo Montella has raised tremendously in the last few weeks. Now, AC Milan have fallen five points behind Inter Milan, who occupy the final Europa League qualification spot. 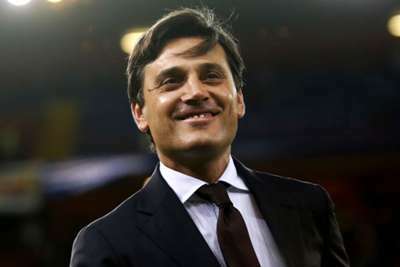 Despite the poor form, manager Montella remains confident that the club can secure European football next season. Milan last finished in the top three back in the 2012-13 season. Since then, their best ever return was a seventh place finish last season.Aware that the club could not be returned to the former glory days under their regime, former Italy president Silvio Berlusconi recently sold the club to Chinese investors. However, the new money is yet to arrive at the club. Montella has had to deal with almost the same squad, but there will be a lot of questions asked about the team after this poor run. Milan have suffered three defeats in the last five league matches, while they were beaten only twice in the previous 10 games. “We have to stay calm to continue on this path. We’re on the right track. I think our growth is clear: we dominate matches even against the major teams.We need to get into Europe and we believe strongly that we can. I believe it. I saw a great game from my team but we needed to speed things up in the second half. We could have done better in the final third and from the point of view of our opportunities. But I can’t blame the players — they put in a good performance,” Montella said.